Ushnar is terrified of cats, but unfortunately a Khajiit beggar has become his shadow. Find Bhisha and either kill him or convince him to leave Crucible. Return to Ushnar for a peculiar reward. Ushnar gro-Shadborgob is deathly afraid of cats. He keeps a lot of dogs to keep cats away. Unfortunately, there is a Khajiit beggar, Bhisha, also in Crucible who likes dogs about as much as Ushnar hates cats. Seeing as how Bhisha is a cat and Ushnar surrounds himself with dogs, Ushnar has a real problem and he'd like you to take care of it by making Bhisha "disappear". Bhisha will often be near Ushnar's dog or dogs, constantly following it/them in the daytime. He reveals that he "loves dogs", which is why he follows Ushnar around. You can either kill him, pay him 100 gold to leave town, or, if you have finished the main quest and received its reward, you can raise his disposition to 70 and he will leave on your word, however if you have not finished the Main Quest you will have to raise his disposition to 90 instead. If you finish the quest without opting to kill him, he will move to Bliss. Return to Ushnar to complete the quest and for your reward. Ushnar says he will give you one of his 'former pets'. Soon, Ushnar's Skinned Hound will appear and follow you. Much like a horse, it will attack any threat to you but can be killed quite easily and does not respawn. Ushnar's Skinned Hound will even travel back to Cyrodiil with you; it appears after fast traveling or resting for approximately 24 hours. Another option is to break into Ushnar's home and steal the Dog Food from a bowl on the first floor. Give the Dog Food to Bhisha, who will then be attacked (and killed) by Ushnar and his dog. One problem with this method is that the fight can occasionally spill over, with Dark Seducers and townsfolk joining in, until the entire population of Crucible is killed. You can kill Ushnar's dog if you like. You will gain a bounty of one gold and will have to answer to a Dark Seducer. This does not progress the quest, however, as Ushnar simply orders a new dog instantly and Bhisha will say Bernice told him about this and he is waiting patiently for its arrival. It does make for an interesting conversation topic of 'Dead Dog' with the two though. Una Armina will occasionally say that she wishes she could have one of Ushnar's old dogs, but there is no option to give the skinned hound to her after completing the quest. Although most likely intentionally done, Bhisha seems to be interested in Ushnar as opposed to his dog. As can be seen when observing Bhisha follow them, Ushnar's dog will sometimes get stuck momentarily in random spots, Bhisha will continue past the dog and stay glued to Ushnar's path. 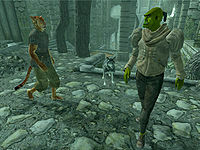 If you are playing as a Khajiit, Ushnar will simply reply to you along the lines of "Filthy beast, what do you want" or tell his dog to attack you (which the dog will do, although the guards will defend you). Therefore there is no way to get this quest (without the console) as a Khajiit. After completing this quest, if you travel between the Shivering Isles and Cyrodiil with the pet Skinned Hound after Rebuilding the Gatekeeper, the Gatekeeper will attack (and easily kill) the Hound. This can happen even if the player fast-travels directly to the Door to Cyrodiil, if you linger in the Fringe too long before going through the Door. Note that whenever you fast-travel, the Hound may take some time (even a day or two) to catch up with you. Some people attack Ushnar's Skinned Hound on sight, so the quest's reward can be a liability. On the other hand, since the dog's corpse does not disappear, it can be used as a safe container. Ushnar's skinned hound can be found in his house on the upstairs floor. You can see it before completing the quest by breaking in. If you take the Skinned Hound to The Arena, everyone will instantly attack it. Occasionally, entering Crucible will cause Bhisha to die from unknown causes; the quest will be updated if it is active, and the reward can still be obtained, however. After completing the quest it is possible that the Skinned Hound will not appear as promised. This can be fixed by entering Ushnar's house, at which point the hound will come downstairs and begin following you as expected. If Ushnar dies before you get rid of Bhisha or the dog, the quest will remain forever uncompleted in your records and you won't get the reward, although you can loot his body. If you take the Skinned Hound to Cyrodiil, there is a chance that it won't ever follow you back into the Shivering Isles. It will instead wait for you by the Strange Door every time you enter the Fringe and resumes to follow you around normally only when you return, meaning that the dog will be stuck in Cyrodiil for the rest of the game. 10 Ushnar gro-Shadborgob has asked me to make Bhisha the Khajiit "disappear." He seems to have a unhealthy fear of cats. Ushnar said he would pay me to do it, buy [sic] he was somewhat vague about the nature of the payment. 100 I have convinced Bhisha to leave Crucible. Ushnar won't ever have to worry about him again. I need to tell Ushnar about it. 110 Bhisha is dead. Fortunately, Ushnar didn't care how he died. I'll need to let Ushnar know that Bhisha won't trouble him any more. 200 Finishes quest Ushnar was very grateful. He gave me one of his former dogs as a pet. There was something strange about how he phrased it though. It is possible to use the console to advance through the quest by entering setstage SE43 stage, where stage is the number of the stage you wish to complete. It is not possible to un-complete (i.e. go back) quest stages. See SetStage for more information. This page was last modified on 22 June 2018, at 23:32.